In the middle ages, natural science included the physical world, planets, stars and heavens. It could include descriptions of exotic peoples and distant regions, lore on animals and astrological treatises. A component of the knowledge maintained and studied by monks, natural science treatises represent a significant subject category in their libraries. This manuscript contains writings on the heavens--often with a mythological spin--and historical material on foreign peoples. It belonged to the priory of Rochester cathedral. One of the treatises, the 'Poeta Astronomica' by the Roman mythologist Hyginus, was copied in a peculiar way. Its first thirty pages are written in two columns, the outer one in small handwriting, which makes it resemble commentaries which were sometimes placed alongside the main text. What the outer column contains, however, is a large portion of the text which should be inserted on page 12. The later note along the lower edge of the page helpfully advises the reader on this. In the upper margin another helpful note tells where to find the table of contents. Patrick Young, librarian to James I, is believed to have written the notes. After the Reformation, a large part of Rochester's huge library became part of the king's library. 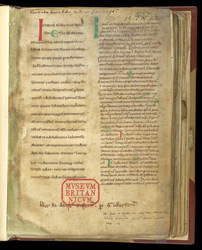 The long inscription across the lower margin was added in the 14th or 15th century, identifying the manuscript as the property of the cloister of Rochester, a gift of 'G.' the cellarer (officer in charge of the monastery's cellar).